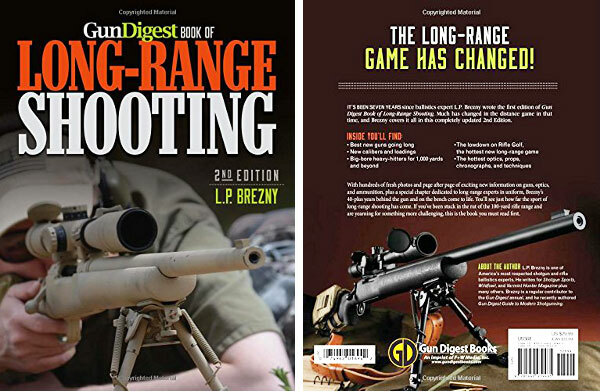 It’s been seven years since L.P. Brezny wrote the original Gun Digest Book of Long-Range Shooting. Much has changed in the long-distance shooting game in that time. Brezny addresses those developments in this completely updated Second Edition, set to be released September 25, 2014. Experienced firearms writer L.P. Brezny has completely updated his popular, original book on long-range rifles and shooting techniques. Readers will find up-to-date information on recent advances in long-range rifles and cartridge choices. The updated Second Edition offers hundreds of new photos and much new information on guns, optics, and ammunition. NOTE: This book has a lot of useful information, but it is written more for the tactical crowd than for long-range benchrest or F-Class shooters. This book is a good starting point if you want to get started in the long-range game. However, you’ll probably find more serious information about advanced reloading right here in the AccurateShooter.com archives. If you want to understand the fine points of long-range ballistics, then get Bryan Litz’s Applied Ballisitics for Long-Range Shooting (2d. Ed), now available in eBook as well as hard-cover format. Share the post "Updated Gun Digest Book of Long-Range Shooting"